"Big Air” is where it all starts. This long jump for dogs is when the dogs jump off the dock into the pool and are measured from where the base of their tail hits the water. There are two techniques in Big Air: Place and Send and Chase. We recommend that new teams start with Place and Send. Place and Send Tips for Beginners: Don’t throw the toy out too far. It’s hard not to chuck it out 30 feet but it has to seem obtainable to your dog and if you throw it too far they will hesitate or refuse to jump off the dock. Conversely, if the toy is too close to the dock many dogs will not want to jump in to get it. For new dogs a distance of about 8-12 feet from the dock is a good place to start. Don’t set your dog back too far. Once you have your toy in the pool, only take your dog a few feet back from the edge of the dock. Dogs need to build confidence in jumping and it is best to slowly increase the distance from the edge of the pool. If your dog is hesitating at the edge before jumping, chances are you have placed them too far out and you should try shortening them up. Hold your dog in place for a little while and get them amped up! This is where we want dogs to be crazy and excited and the more excited they get to go get that toy the better they will jump. And when they are ready to go be sure to release them with the same command. Be patient and keep it positive! Some dogs “get” Big Air in no time while others need more encouragement. As with any training, keep sessions short and positive and always reward and praise your dog for a job well done. Once your dog has mastered Place and Send and is jumping consistently with no hesitation you can move on and try the Chase technique. This method requires much more teamwork along with excellent timing and hand-eye coordination by the handler. This method is for dogs who track toys in the air and will usually produce the longest jumps. For Chase, the team goes up on the dock and the handler has the dog sit (and stay) at a certain position while they walk to the edge. Once the handler is ready, they release the dog (usually with a verbal command or hand signal) and throw the toy as the dog jumps off the dock. Chase Tips for Beginners: A good sit-stay is everything. Handlers only have 60 seconds during competition to have their dog in jumping motion off the dock and trust us…that time goes by quickly! If you accidently drop or throw your toy into the water, you cannot get it back and try again. You must send your dog into the water or exit the dock and pass on your turn. If your dog gets up on the dock and jumps into the water, do not throw your toy in afterwards as you have one chance to get your dog out of the water and in position again. Throwing the toy in completes your jump and also remember that you only have 60 seconds so you must get your dog in position and in jumping motion before time is up. Timing is essential as you don’t want to throw it too early and throwing it too late will often result in the dog taking it from your hand! Work on throwing it just before your dog reaches you so that the toy remains directly in front of them but just out of reach. This is what will get them to stretch for the toy. Don’t throw it laterally. Dogs need lift to achieve the greatest distances so work on not only throwing the toy out but also up. The name of this technique says it all-you want them to chase it from the time they jump to the time they land in the water. When practicing, once in a while allow your dog to catch the toy when you throw it. This helps build their drive and they will seek this reward each time they jump. Practice, practice, practice! Whether on land or on the dock, this technique takes a lot of time and effort to perfect. Land Training There are many things you can do on land to supplement and enhance your dock training. Basic obedience is essential including a solid sit-stay (with distractions) and recall. Food or treats is not allowed on the dock so practicing obedience with other rewards (such as toys) is suggested. Since access to a dock can be limited, you can replicate some of the basics of Big Air on land. Fetch/retrieve drills in the backyard are easy to do and can also be a good way to build toy drive. You can practice Place and Send the same way but of course your dog is not jumping into a pool but it will help them understand what you are asking them to do. You can also practice short throws with the Chase technique but be mindful of how high they are jumping and onto what sort of surface in order to prevent injury. Finally, the handler can practice their throwing technique (without their dog) by using a hula hoop placed on the ground. Stand back and try and throw the toy into the hoop. Increase your distance and work on perfecting the arc in the air so that your dog is jumping both out and up. You can use any kind of toy in DockDogs as long as it floats, isn’t edible (sorry, you can’t throw a burger into the pool) and isn’t alive and never has been (don’t ask). Obviously, some toys are better suited to this sport than others. Many handlers use “bumpers” also know as retrieval dummies and come in a variety of sizes and colors. Others prefer Wubbas or squeaky toys while some stick with the simplicity of the tennis ball. It’s really up to you and more importantly, what your dog prefers. 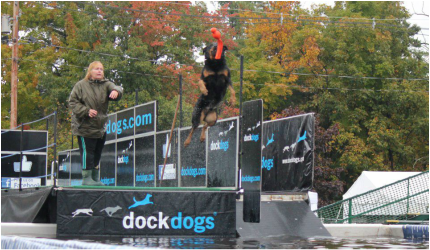 We recommend that you choose a toy that is only used for DockDogs and/or other “special” occasions or activities. Many dogs get nuts about a certain type of toy so make that toy something they only get to play with when you are practicing or at an event. If you let them have it everyday and for any reasons the novelty can wear off and it may affect their desire to jump after it. If you are doing the Chase method, be sure to choose toys that are also easy for you to throw. Building Toy Drive Some dogs have innate drive that comes out the minute they see a toy while others need specific training to build it. But all dogs’ drive can be enhanced with fun games and activities. Flirt poles are designed to encourage dogs to chase something while tugs work at teaching both drive and control. And of course, the more fun and positive it is for the dog, the more they will want to do it. Stay tuned for more information and resources on this topic. Sometimes beginner dogs will have a great deal of drive at home or at the park but when they come to practice or an event they show little interest in the toy. In most cases this is because they are overwhelmed by the environment so it’s best to work on their confidence and expose them to high stimulation places as much as you can, but be sure to keep things positive and for short amounts of time. Be patient and keep working with them and remember, your dog CAN do this! Speed Retrieve and Extreme Vertical are two discipline that we will help you with once your dog is comfortable with Big Air.